Hey there everyone! My name is Kyle Robinson. I began working here with Music & Arts summer of 2016. I started with music heavily in high school, learning both percussion, guitar and bass. Now since working, I’m dabbling in sax and trumpet. 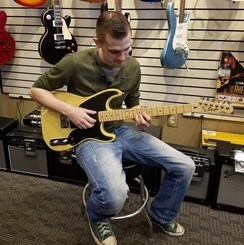 I have worked in sales practically my whole life and look forward to not only getting you the instrument you need but getting you set on the right path to becoming an excellent musician!